“I don’t even feel like I had any say in the matter,” says Ashlee Meadows of Raleigh, North Carolina on her path to becoming a designer. 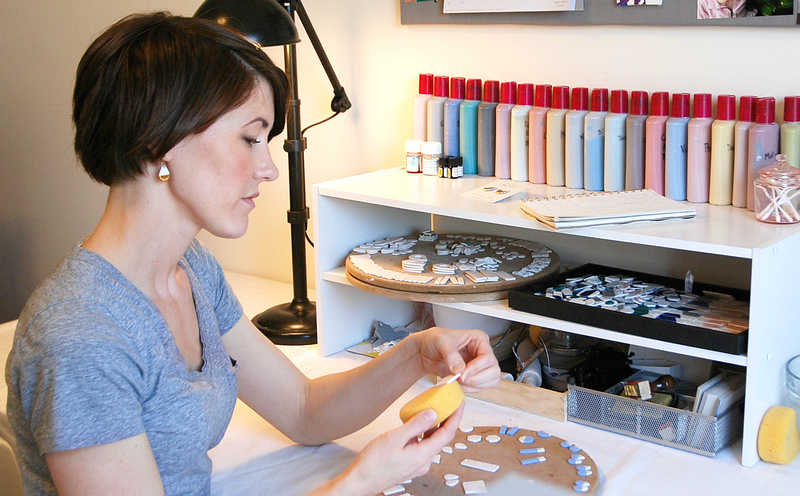 “I feel like designing is quite often not a learned skill, but something that comes very naturally to many artists.” Of course, this porcelain jewelry maker is glad she earned her BFA; in addition to learning more about design and composition, she gained the technical knowledge needed to work with clay, from glazing to firing delicate works of art. For her collection—under the moniker ASH—she meticulously shapes every piece of porcelain, dips it in glaze, and paints it with a brilliant gold luster before firing it three times. “The final product is not complete until I string the pendant on a 14k gold-fill chain,” she says. A modern take on the hoop earring, these 14k gold filled Tri Earrings are super versatile. Each earring is created by hand using square wire that catches the light perfectly. They come with rubber backs to keep them in place. 2 " in height and 5/8" in width, 14k gold-filled square wire.